Book Store Hours: Every Wednesday and Saturday from 10-1. Closed holidays. The original Descanso library and current book store. 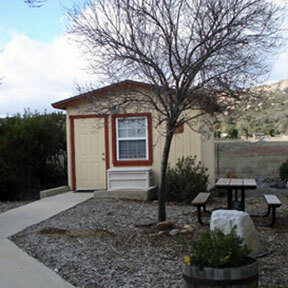 The Book Store is located, next to the library, at 9545 River Drive in Descanso. Media $1.00, Children's books are free. The Book Store has a great selection of used books including children's books and books about Descanso. We also sell videos, audios DVD's, tote bags, our Descanso License Plate and note cards. Our books are reasonably priced. All Book Room income goes directly to programs and supplies for our branch library. We help purchase extras, such as books, computers or furnishings, that are not included in the official library budget. The book store is staffed solely by volunteers and we're always looking for new faces. Please visit our book store and browse. We think you will enjoy it and maybe you'll decide to become a regular customer, or even a book store volunteer. During the long hot summer days, pick up a book at the Book Room and then relax and read in the Descanso Library. A note worthy of mentioning in the summer: We have air conditioning !!!! Many thanks to our book room volunteers - The Book Room wouldn't exist without you!